We offer sideline cheer for ages 5-13 and competition cheer for ages 6-13. 5 year olds will be Jr. NAFL Cheerleaders and cheer for 2nd Grade Tackle Football Teams. Jr. NAFL cheerleaders must turn 5 by August 2, 2019. 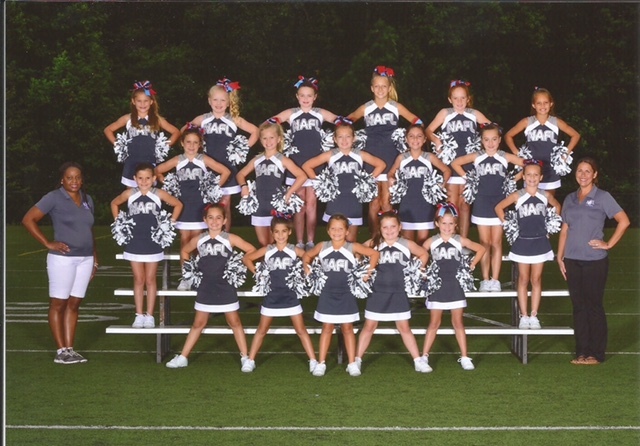 Jr. NAFL cheerleaders participate in all cheer related activities and cheers at all football games. We offer professional cheer instruction to all cheerleaders during the NAFL Cheer Camp held in late July. All participants will receive professional instruction on stunts, jumps, motion technique and tumbling. Tuesday & Thursday from 6:00-7:30pm at North Park on the Miracle League Field. Cheerleaders are required to attend both practices and all games. Cheerleading is a team sport and all team members should be present at all practices and games. Please do not sign up your daughter for other activities that conflict with cheer practice days and times. Games are held on Saturdays at North Park. Travel to other parks may be required. Our first practice will be held on Tuesday, August 6, 2019 at North Park at 6pm. We do allow cheerleaders in the 6th, 7th and 8th grades to cheer in the NAFL program. Cheerleaders who are in private school and those who do not make their middle school feeder team are welcome to cheer on the 5th/6th grade team. Note: If there are not enough girls to make a complete squad in an age group, I reserve the right to combine squads or change age groupings where needed. All cheer teams will participate in the Cheer Bowl held in November. Each cheer squad will learn a competition routine that will double as their halftime routine. The competition routine will be taught at Thursday's practice and performed on Saturdays at halftime of your football game. This will ensure that each squad is ready to compete on competition day. The date, place and time will be sent to you when that information is released. Cheer Bowl is not mandatory, but if you do decide to participate, yu mustbsign the cheer bowl attendance policy & cheer at all mandatory playoff games, cheer the entire game, and overtime minutes to be eligible. Please read the cheer boel attendance policy at the bottom of the page. Uniforms are separate and are not included in registration fees as they are custom made and yours to keep at the end of the season. please read Cheer Uniform document below. Uniform Fitting #1: Saturday, May 18, 2019 from 9:30am-11:30am in the North Park Football Field 1 Press Box. Uniform Fitting #2: Monday, June 3, 2019 from 6-7:30pm in the North Park Football Field 1 Press Box. Old Soldier’s Day Parade on Saturday, August 3, 2019 in downtown Alpharetta. This is a great way to support the community and put the spotlight on the NAFL organization. GSU Spirit Day: Spend the day with the Georgia State University Cheerleaders and Dance Team. We will learn a dance routine taught by the cheerleaders and then perform the routine at the Georgia Dome during halftime of the game. This is an optional event. TBD for 2010. Volunteer Opportunities: Cheerleaders will have the opportunity to give back to the community by cheering on participants at select Miracle League Baseball games on Saturday mornings. Breast Cancer Awareness Initiative: This year we will support Breast Cancer Month in October by using pink poms and wearing pink hair bows.